Instead of “Baseball Cards,” imagine if children collected “Teacher Cards”? Every week, students saved up their allowance to purchase their “Teacher Cards” and a stick of stale gum from the corner store. Jenn: I hope I get a Mr. McCue! You should see him hit all learning styles in one class! Marc: Do you think I can get Ms. Erikson to sign her All-Star Card? Ya know, the one she earned for her unit on cells? Jenn: WOW! Mr. Whitten’s rookie card! Look at his awesome mustache! Marc: I can’t wait until I’m older. Then I can be a teacher and I can be on one of these. I spent my morning run thinking about how useful “Teacher Cards” could actually be. Imagine passing them out on the first day of school so that students learn about your teaching philosophy and how to get a hold of you. Prior to the first open house, now parents have more of a frame of reference as to who the teacher is. At conferences, when meeting someone you can check into what they teach, “Oh you have experience teaching Psychology? Let’s get lunch!” If the cardstock weight is right, you can also try to flick them as far as you can in the auditorium! I decided that since I am on a rather long train ride to Philadelphia (and the wifi is on the fritz so I can’t correct research papers as planned) that I would start making them. So without further ado, please meet some of the All Stars that I work with! Note: I will eventually make complete sets of my two departments, so fear not! Want to use the template above to make your own? Check out this post! This entry was posted in Reflection and tagged education, Humor, Teachers, Trading Cards. Bookmark the permalink. 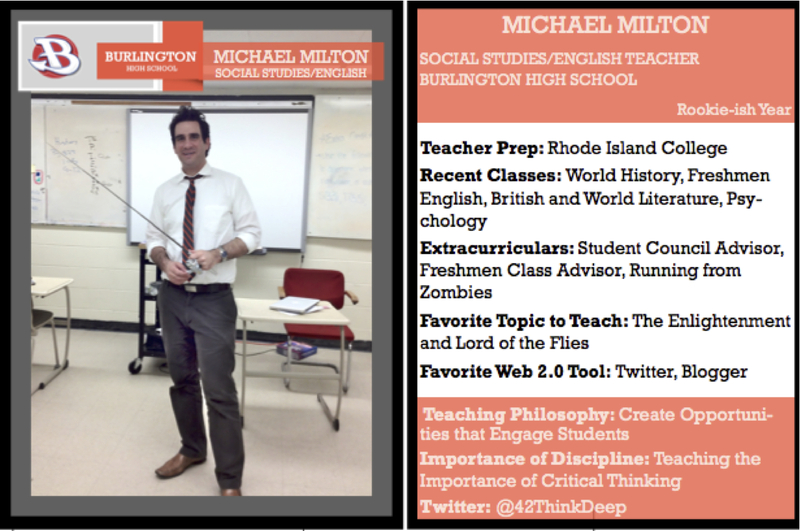 6 Responses to Teacher Trading Cards: Collect Them All! I didn’t have a mustache my rookie year. Wow! I have been enjoying the response to this post. I’ve had several requests for templates – I will put one together and post it later this week. I have found it interesting that while I stood in line for a Dwight Evans autographed baseball card, I never asked Mr. McCue (my high school history teacher who inspired me to teach) for one. I am going to rectify this soon.